At 2013 SE Regional Fruit & Vegetable Conference, Interstate Container will showcase Greencoat® wax-free boxes for fresh produce industry, from 10-13 January 2013 at the International Trade & Convention Center in Savannah, GA.
Interstate Container’s representatives will meet with large growers and packers of fresh fruit and vegetables from around the world to promote compostable FBA-certified Greencoat® boxes. Why Choose Greencoat® as a Fresh Produce Packaging Solution? 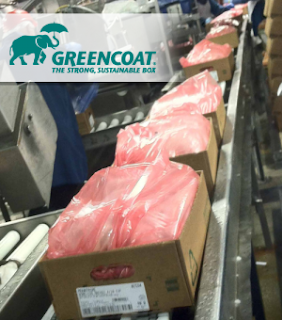 Interstate Container invested five years of research and development to develop and trial Greencoat® sustainable boxes. The compostable FBA-certified corrugated boxes offer sustainable solutions for companies in need of strong and moisture-resistant corrugated packaging. Greencoat® boxes are being used up and down the east coast to protect and preserve fresh produce such as cabbage, cucumbers, eggplant, peaches, peppers, squash, tomatoes, and yams, in addition to seedlings. 903 Woods Rd 128 Crews Dr.